It's our sixth fall without Post Road Pumpkin Ale, and the ache has not diminished one drop. 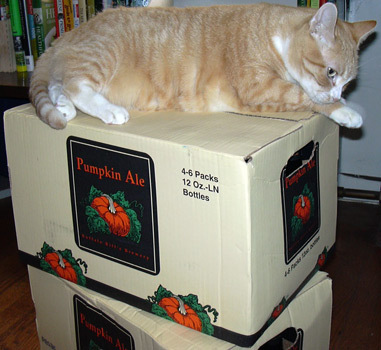 If anything, Dr. Mathra's time in New Jersey over the summer exacerbated the yen, simply because he was so close -- in both time and place -- to the release of our favorite pumpkin ale. Buffalo Bill's crop has just come out; $7.99 for a six-pack at Lucky. I'm sure we'll get some to celebrate the coming season, but meh. I want the real stuff, the beer that began it all. Dammit, Brooklyn Brewery, you distribute to Canada, Europe, half of the US, and Asia! ASIA, for crying out loud! Why not to California? Mathra, god love 'im, brought back two bottles of New Jersey-purchased Harpoon Winter Warmer in his luggage for me. A local liquor store had a bunch knocking around from last winter, so he snagged me a few. It was actually the Winter Warmer that got us started on the whole spiced ale kick in the first place. 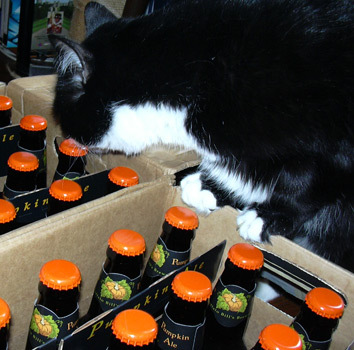 After we got addicted to that, we tried Blue Moon's pumpkin ale. (I think they call it Harvest Moon now, but back then they weren't mooning about with fancy names.) It was okay, but not spicy enough for us. All of a sudden, pumpkin ale seemed to be everywhere. John Harvard's Brew House had a version for which they rimmed the pint glass with cinnamon and sugar. It was okay, a bit thin in the mouth. The sugar rim was unnecessary and sort of girly for beer. For the record, we've also tried: Cambridge Brewing Company's Great Pumpkin, Dogfish Head Punkin, Pumpkinhead Ale, and Smuttynose Pumpkin. None of them hold a candle to Post Road. Finally, at University Wine -- our favorite liquor store on Mass Ave. -- Mathra overheard two of the owners discussing "the new Post Road pumpkin ale." We got it, we drank it, we loved it. We loved it so much that when we'd peer into Cambridge Commons' dark windows and see it on tap, we'd drop any plans we had for dinner and hie us hence. The rest is history, we'd stock up on cases every year to sustain us until the next season, and we'd still run to Cambridge Common for a draft version over a bottle. Now, however, we're bereft of beer. All we have to keep us warm in the lean months, turning to years, are faded memories and a bent silver and orange Post Road bottle cap sitting on my dresser. And it's all because Brooklyn Brewery won't distribute to California.